The British gold sovereign is one of the most ‘collected’ gold coins in Ireland today. We used it when we were part of the UK and it would seem that we are still hoarding them. Named after the English gold sovereign, previously last minted in 1604, the name was revived with the Great Re-coinage of King George III in 1816 … and minting began in 1817. The reverse design had an ennobled Garter surrounding the image of St George armed, sitting on horse back encountering the Dragon with a spear. The legend translates as ‘evil to him who evil thinks’ . The obverse featured George III facing right with short hair with a laurel crown of a Roman emperor with the legend in taller than usual lettering. 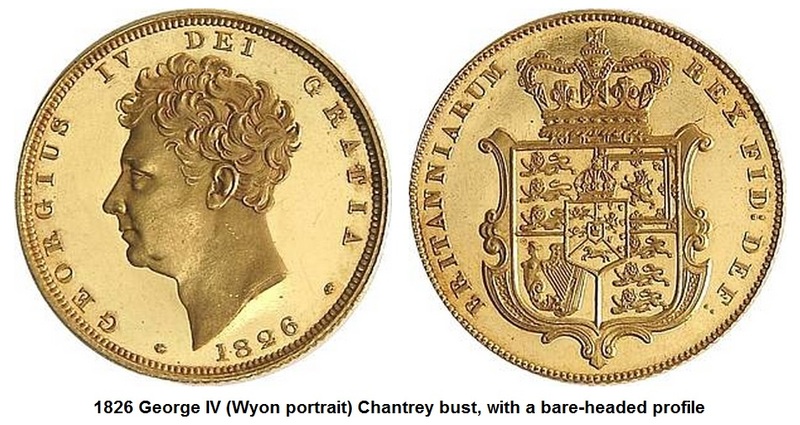 George IV sovereigns are unusual insofar as there are two different portraits – the first follows in the classical (Roman) style of the ‘laurel head’ and features ‘St George & the Dragon’ on the reverse. The second design features a ‘bare head’ design by William Wyon, with a coat of arms (shield) on the reverse. William IV followed in his father’s design taste, opting for a ‘bare head’ design by William Wyon, with a coat of arms (shield) on the reverse. 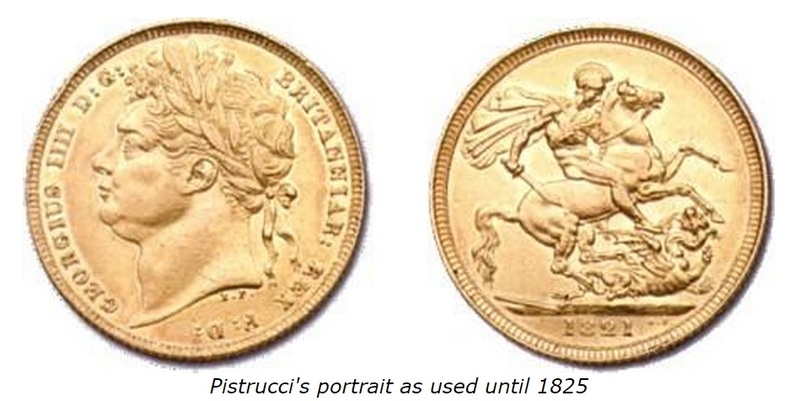 From 1838 to 1870 (inclusive), all British sovereigns were minted in London. Since there were no other mints, there was no need for a mint mark. When overseas mints became established, they used a mintmark. Those coins minted in London continued to be issued without a mintmark. During the 1850s, the state of Victoria alone contributed more than one-third of the world’s gold output. Although a Mint opened in Sydney in 1855, it had difficulty keeping pace with the output of the goldfields and in 1871 a new branch of the Royal Mint opened in Melbourne. Melbourne sovereigns carry a small ‘M’ to identify them. 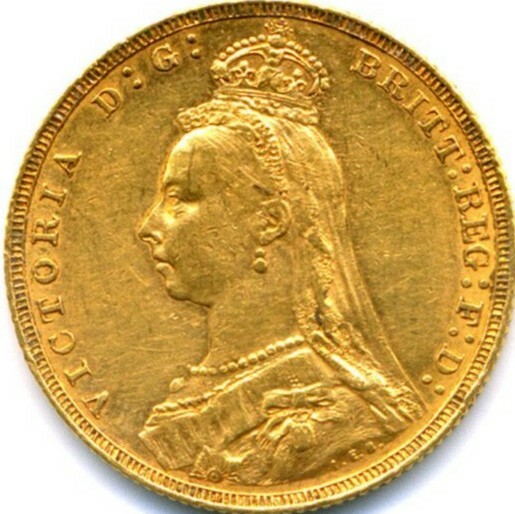 Millions of pounds of gold bullion were shipped from Australia to London each year to be minted into coin. However, it soon became apparent that it would be easier to refine the gold and turn it into coins at source, rather than transport it to Britain and have it turned into coins there. Sydney, Melbourne, and Adelaide each submitted to be the venue of a branch of the Royal Mint and after some deliberation the British government awarded it to Sydney, which began issuing coins in 1855. 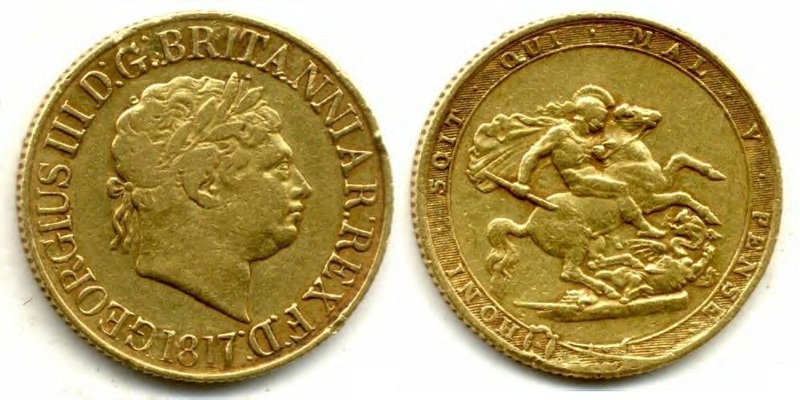 This mint issued coins with its own design from 1855 until 1870 then, in 1871 the Royal Mint insisted that all gold sovereigns regardless of Mint should carry the British design. The coins minted by Sydney carry a small ‘S’ mintmark to identify them for quality control purposes. It made good sense to produce British sovereigns close to the gold mining source areas, rather than ship the gold to London to be made into coin, then possibly ship it back again. The gold mines at Kalgoorlie and Coolgardie in Western Australia, once discovered, quickly became recognised as two of Australia’s richest. The problems of transporting the raw gold over 2,100 miles to the nearest Mint in Melbourne were obvious and so a new branch of the Royal Mint was authorised and opened in 1899. Sovereigns minted at Perth carry a small ‘P’ mintmark. The Klondike Gold Rush of 1897-1898 saw more than 25,000 people seek their fortune in the frozen North of Canada. For some time all of Canada’s coinage was struck in England but these new gold strikes made this impractical. In 1908 a Canadian branch of the British Royal Mint was opened in Ottawa. As well as producing silver and base metal coins for everyday use, the new Canadian mint also turned the recently discovered gold into sovereigns striking intermittently between 1908 and 1919. Sovereigns of this mint carry a small ‘C’ mintmark. King George V and Queen Mary were crowned at Westminster Abbey on 22 June 1911 and they were subsequently enthroned as Emperor and Empress of India at New Delhi on 11 December 1911. George V was the only monarch whose effigy appeared on sovereigns from all seven mints. George V reigned during the height of the British Empire and, consequently, the Royal Mint’s reach. The tumultuous events of World War I, the collapse of the international monetary system and the demise of the gold standard meant that he would be the last King to grace the gold sovereign as a ‘circulating’ coin. Another branch of the British Mint was established in Bombay in India in 1918, where the demand for sovereigns was particularly high. The Bombay mint only produced coins for one year and all are dated 1918. Nonetheless, the Indian mint struck more sovereigns (approximately 1.3 million) in its single year of operation than the Ottawa branch managed in more a decade. Sovereigns from the Bombay mint were distinguished by the letter ‘I’ for India. The next branch mint was established in Pretoria (South Africa) in 1923. Like the Australian and Canadian mints, this was set up to turn locally mined gold into coins. Significant quantities of gold were discovered in Johannesburg in 1886, setting off another mass migration as speculators, prospectors, fortune-seekers, and adventurers from all over the world descended upon the region. By the end of the 1890s the area was responsible for a significant percentage of global gold production. Sovereigns, identical to the British coins except for the inclusion of an ‘SA’ mintmark, were struck at Pretoria between 1923 and 1932. 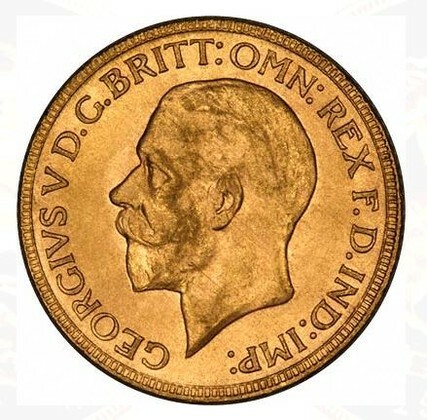 The George V ‘large head’ gold sovereign circulated from 1911 to 1928 (inclusive). The total gold sovereign production is difficult to calculate. Sovereigns were produced in large quantities until World War I, at which time the UK came off the gold standard. From then until 1932, sovereigns were produced only at branch mints at Melbourne, Sydney, Perth, Bombay, Ottawa, and Pretoria (except for some in 1925 produced in London as part of Winston Churchill’s ill-fated attempt to return the UK to the gold standard). In Victorian times it was the practice of the Bank of England to remove worn sovereigns and half sovereigns from circulation and to have them re-coined. It is estimated that in circulation a sovereign could have a lifespan of up to 15 years before it fell below the “least current weight”, i.e. the minimum amount of gold below which it ceased to be legal tender. Consequently, although over a billion sovereigns have been minted in total, that figure includes gold that has been coined and re-coined a number of times. In addition, when coins were sent to places such as the United States for international payments between governments, they were frequently melted down into gold bars because of the Federal regulations then in force. When gold coins were finally withdrawn from circulation in 1933 in the US, many thousands of British gold sovereigns were consigned to the melting pot in this way. As such, the mintage figures above in no way reflect the survival rates of these coins.